Learn the basic building blocks of reading with Creating Readers, the comprehensive resource that develops a strong foundation for pre-readers. 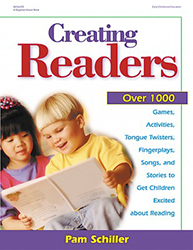 Creating Readers gives teachers and parents the tools to teach pre-reading skills with over 1000 activities, games, fingerplays, songs, tongue twisters, poems, and stories for the letters of the alphabet. This invaluable resource develops the child's desire to read as well as the skills needed to begin reading. Creating Readers starts children ages 3 to 8 towards a future rich with books and reading.